Stay in a hotel with a soul, whose charming buildings nestle harmoniously in the heart of a wooded park. A hotel where our teams are at your disposal to ensure that you feel perfectly at all times during your stay. A key word:"enjoy" sports activities, relaxation, landscapes, animations and encounters. An exceptional situation in the bay of ants on the mythical peninsula of Saint-Jean Cap Ferrat with an access to the beach 5 minutes from the hotel by a footpath... A vast garden overlooking the sea, surrounded by superb villas rivalling beauty... An outdoor heated swimming pool facing the sea... In this dream setting, a master word: Enjoy... sports and relaxation activities, landscapes, animations, meetings. Here, you live outdoors from morning to evening and will not know where to head between the activities on the spot (sailing, pedal boats, paddle boats, zumba, stretching or aquagym...) and the many walks, visits in this superb region or excursions proposed (customs trail from the hotel, Marineland, the Oceanographic Museum of Monaco, the Ephrussi villas of Roths, etc.). NEW: Free wifi access in all rooms and the main building. Parking closed and covered. Baby bed loan and bathtub in the bedroom. baby bottle warmer, microwave, highchairs, booster chairs and small pots available during restaurant opening hours (on request). Everything in this magnificent setting has been designed around the outdoors and the breath-taking landscapes: rooms scattered throughout the grounds, most of them with private terrace, restaurant with a stunning view of the sea, pool overlooking the sea, etc. NEW: Double or family rooms entirely renovated and air-conditioned, distributed in the park, with private terrace (for the most part). The 3-star Club Delcloy comprises a reception building and small lodges set in the midst of the three-hectare grounds. There are 102 one to six persons rooms with flat-screen TV, telephone, shower room, separate toilet, safe and private terrace with garden furniture (except single rooms). Hotel service. The children's beds in the apartments are not suitable for adults. "Les 2 Caps" panoramic restaurant with sea view and terrace bar. The chef prepares traditional cuisine influenced by Provence and the sea, served as buffets for starters and hot dishes. There is one themed evening a week, e.g. Italian pasta party or Spanish paella. Wine list. Half-board and full board available from dinner on Day 1 to breakfast on the last day. Breakfast 7.30 to 10.00 a.m.
Dinner 7 to 8.30 p.m.
Our bar and its terrace offers you a light snacking type restaurant. 100 % leisure programme: activities guaranteed and included! As well as having fun on the beach, you can enjoy lots of other fun activities with your family during your holiday in the Provence-Alpes-Côte d'Azur region. Below are a few suggestions for activities your children will love and that will make your family holiday unforgettable. Hiking with an entertainer in half day, discovering the surrounding landscapes. Stretching, aquagym (according to season). Private cove with kayaks and paddles, fins, masks and snorkels, parasols and deckchairs, available. Rental of pedal boats. Sailing courses during school holidays : funny and playful mood, 3 activities offered in small groups (6 to 12 people), supervised by qualified instructors: optimist courses, windsurfing or catamaran, adapted to all ages. Numerous hiking trails: the Maurice Rouvier Parkway (1.3 km - accessible to all), the Pointe Saint-Hospice tour and its chapel (3 km - easy), the Cape Ferrato tour and the magnificent panoramas (7 km - medium). For a leisure-filled holiday in Hyères-les-Palmiers, visit our 3-star Club Plein Sud. They offer a wide range of sporting activities for all ages, including sports tournaments, team games, art and craft activities, group games, treasure hunt, mini disco, environmental awareness and protection activities, theatre workshop and production of a show. We develop their creativity with fancy dress and shows and help them to discover nature by playing outdoor games. The children enjoy fun sporting activities packed with thrills and laughs and make lots of new friends. There is a large bouncy castle in the grounds. Sporting activities, team games, sport and friendships. Laughter guaranteed! The children will make lots of new friends and develop their creativity by putting on a show and performing sporting activities. Holidays ... a souvenir factory that makes your children grow! In all the Vacances Bleues clubs, there are many opportunities for discovery and sharing of highlights for your children: shows, dances, festive snacks, great games where children, parents and grandparents team up ... Because we know That holidays are moments of family sharing, transmission and exchange, we design the clubs with the aim of bringing together the different generations of the family. Challenge BLOUBI: a game of collective address. BLOUBI party: Every evening, go on the dance floor with the entertainers! BLOUBI awards: At the end of the stay, the graduation with a photo session and a dedication of Bloubi. Vacances Bleues Plus: mini prices for your little ones! Free all year round for children under two. 50% discount for children from 2 to -6. 25% discount for children from 6 to -12. Over 5 days. All the strings of magic. Mentalism, close-up, great illusion and levitation... Great show on stage to end the stay in beauty! From 20 October to 03 November 2018Over 5 days. Creative malefic workshops, frightening playful games, evening spells where the children will become witches, ghosts or vampires and without forgetting... sweets with goggles! NEW: On a daily basis, our group Jean Stalter Quartet will offer a musical moment for the general public during the aperitif and a concert evening. Four musicians are waiting for you! They have some surprises and all their talent. Unity of tone, rhythm, coherent whole, although each one expresses itself fully, that swing in the velvet and it is very pleasant to listen again to these standards which made the happiness of many. No extra charge. Over 5 days from Sunday to Friday: Our counsellors alternate between relaxation and relaxation sessions: sophrology, self-massage, Tibetan bowls, yoga and an entertainment program. Over 5 days July - August 2018. Adults and children. Monday to Friday (2am or afternoon). 6 to 12 people. In partnership with the Yachting Club of Baulieu-sur-Mer. Optimist (children from 7 to 12 years old) 125€/pers. Windsurfing board (adult or child +10 years old) 150€/pers. Catamaran (adult or child +12 years old) 150€/pers. Licence French Sailing School in addition: 10€/person to pay on site. A "sailing passport" will be given to all participants. Your holiday in the mythical "baie des fourmis"
Situated only 10 km from Nice and Monaco, Saint Jean Cap Ferrat, a small peninsula of 248 hectares, offers its visitors the charm of a preserved and enchanting site. A veritable oasis of greenery in the heart of the Côte d'Azur, with more than 300 days of sunshine a year, it is an ideal holiday destination: beaches and tourist paths along the shoreline, allow you to evolve in a sumptuous natural setting where luxurious villas and magnificent gardens crown this eden. The Saint Hospice Chapel, the Ephrussi villa-museum in Rothschild, the many Belle Epoque villas bear witness to a past steeped in history and culture. The seaside paths between sea and land, arranged and bordered by Aleppo pine trees, stretch out over 14 km to make simple walks or real hikes. You will be amazed by the beauty of this nature, the luxuriant Mediterranean vegetation favoured by its mild climate. Enjoy also the Nice hinterland and discover Italy: walks, sandy beaches, amusement parks, museums, typical villages... are just a sample of the activities offered by this magnificent region that is the Côte d'Azur. Trail of customs officers (seaside) to go around St-Jean-Cap-Ferrat. Walk to the citadel of Villefranche. Walk in the heart of St-Jean, to discover the beautiful and imposing villas (villa and garden Ephrussi de Rothschild in particular). Ports and beaches of Beaulieu sur Mer. The villas Kérylos and Ephrussi de Rothschild 10 minutes walk from the hotel, the shellfish museum. Exit A8 Nice Promenade des Anglais. 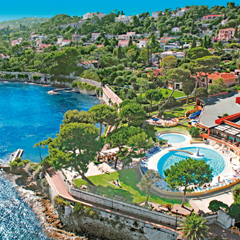 Take the Lower Corniche towards Villefranche/Monaco, then Saint‐Jean-Cap‐Ferrat. Turn left before entering the Cap, then head towards Beaulieu/Casino, Villa Kerylos and then take Avenue Jean Monnet. Beaulieu‐sur‐Mer station 10 min. from the Club + taxis (approximately € 10). Check-in: Saturdays from 5 p.m. Excluding special and à la carte breaks. HALF-BOARD PACKAGE: Accommodation in half-board (breakfast and dinner), entertainment for children and adults at the times indicated, access to the sports facilities of the hotel, daily cleaning. ​50% discount for children from 2 to -6. 25% discout for children from 6 to -12. 10% discout for children from 12 to 14. These benefits also apply to single-parent families.